"there is no labor cost to us..."
Walter Jefferies has been building his butcher shop for a very long time. So long in fact that I had to go back and look to see when he first started working on it -- in April of 2008. 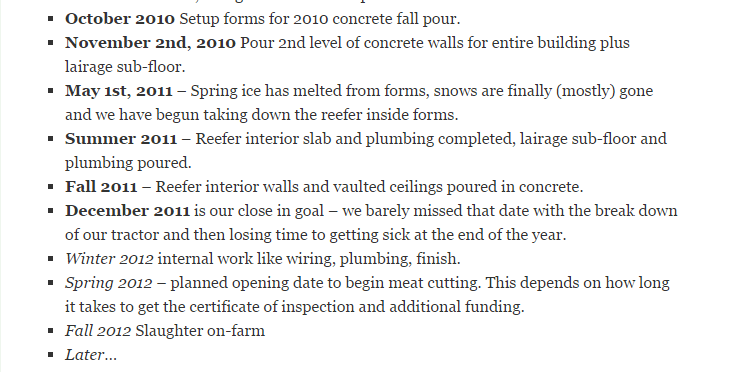 7+ years later he's got the building in some sort of shape, but hasn't finished what I consider to be the most important stuff -- the food-handling documentation that allows your facility to be licensed, His schedule lists that as being done in winter of 2008 -- and a 7 year slip is a long, long time. He could be licensed by either by state or federal agencies but apparently hasn't finished the required paperwork. 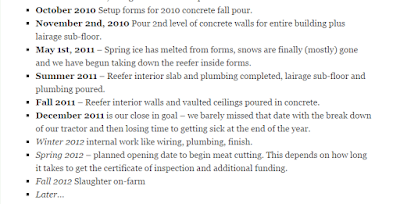 On the project, Mr. Jefferies does put up schedules every couple of years, and then slips the dates on them. It's a bit reminiscent of a sofware project, actually. He's at least 3 years behind where he thought he would be in this project is what it looks like to me. A 40x40 pole barn, concrete floors and washable walls, floor drains and so on, would have cost him around $50k. But the real cost that he's ignoring is that this building has consumed all of his time for the last 7 going on 8 years, and he considers that to be worthless time. I think the other way about this stuff. I always figure labor costs at $15/hour -- which is higher than typical farmhand pay around here, but if I do it that way, and it pencils out, I can afford to pay someone to do the work in my stead. 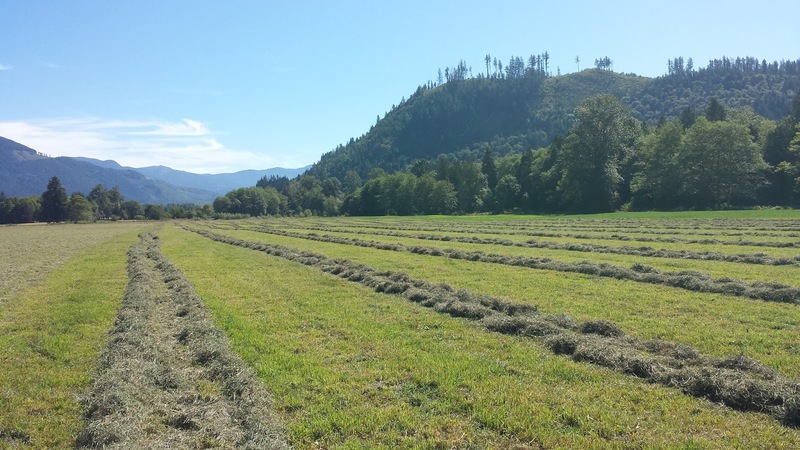 If you're running a farm you have a lot of different demands on your time -- some of the time you can schedule, some you can't (like when its sunny enough to make hay) -- and time that isn't devoted to something, for me anyway, is pretty precious. It's very difficult for me to make time to leave the farm, for instance. It's been interesting watching him work on this project, and it reminds me that when I think about this sort of thing that I should probably run it by cooler heads to make sure that it makes sense. I'm not convinced that this direction gets him to where he wants to go as fast as other choices he could have made. Note: I've donated money to Mr. Jefferies and solicited donations for Mr. Jefferies to complete this project. I think it would be great if it does work out for him. One of the blogs I watch is written by a professor of meteorology over at the University of Washington, a fellow named Cliff Mass. 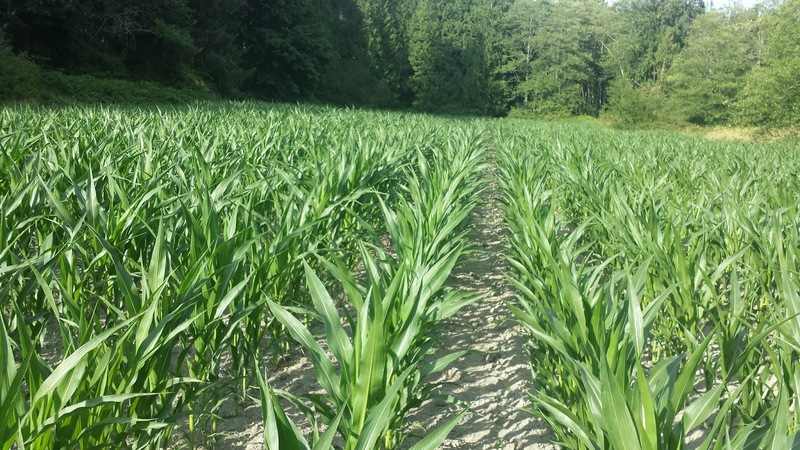 Professor Mass' blog is one of the reasons that I chose to plant the crops I did this year, and so far, he's been spot on in his prediction of a warmer, drier summer than usual. So when he posted recently about long-term forecasts for the coming 12 months, I'm all ears. In short, he's saying that there's a pretty good chance that we will get less rain this winter (and have lower snowpack levels) than in an average year, and that this could mean water shortages for the cities around here. It doesn't mean that we'll get no rain, like the 55 day no-rain period we had just end, but it does make a difference in my farm plan. As far as drinking water and water for the animals, I've got two sources that won't be affected much by the drought. One is that I'm allowed to draw 5,000 gallons a day out of the local river to water the livestock, and the second is that I've got two deep wells, one that services the barns, and one that services the house and offices and milking parlor, and I have senior water rights to many acre feet of water from those wells. But as far as water goes, one of the biggest assets I've got on my farm is my manure lagoon. It holds about 11 acre feet of water, and is part of the system that makes sure that any nutrients that my farm produces stays on my farm. We collect the manure in solid and liquid form during the months where it is too cold for plants to use it, and spread it on the plants when its warm enough for them to benefit. All of the water that hits the concrete between the barns makes its way into the manure lagoon via a large pump. 1) Keep the manure lagoon pretty close to full at the start of the growing season; which around here starts in on April 25th... well, earlier than that probably this year. Remember -- warmer than normal conditions. So by the 1st week of April, I want to be at the top. 2) Install efficient irrigation systems for those crops and plants that might need it. For me, this means I'll put in drip tape for the grapes and probably for the fruit trees I've planted. 4) Seriously consider getting some sort of irrigation equipment for watering my pastures. Something like a wheel line would probably work pretty well. This year I've found that an inch or two of water at the right time increases growth quite a bit, so I want to make sure that I'll all set in the event that the long term forecasts are correct. 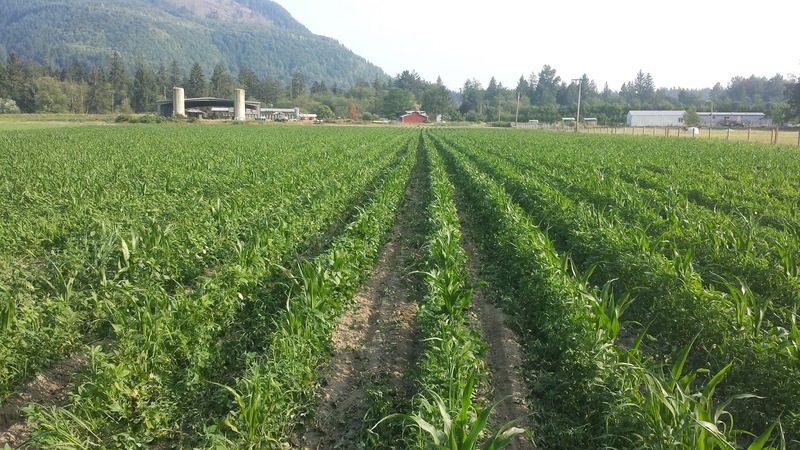 Irrigation means that my pastures are growing about twice the rate of the neighboring fields, and that makes a different to my farms bottom line, too. The long term forecasts have been correct so far, so I don't have much reason to doubt them now. 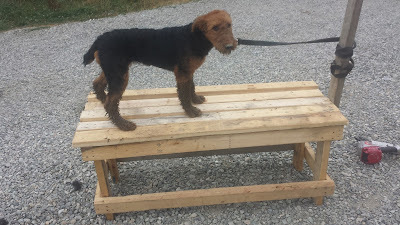 Built a grooming bench to make it easier to care for the farm dogs. Brush them down and remove burrs and matted hair, inspect for ticks and fleas, check them for various wounds, cuts, bruises or any other injuries. I own 9 airedales at this point; they spend most of their time investigating things; the injuries come when they dive into blackberry bushes when chasing a rat; which may be a real rat or an imaginary one. Either way they think it should be chased. If the dogs are particularly dirty I'll bring a hose over and soap them up and get the worst of the dirt off. I use a systemic flea medicine, which is probably why I haven't seen any ticks on them this year. I do see some fleas from time to time -- figure they get transferred to the dogs from rats that they kill and eat. I was paying for individual licenses for each dog, but finally figured out that the county I live in provides you a bulk-dog discount in the form of a commercial kennel license. for $250 you can own up to 20 dogs; the zoning that I'm in (Agriculture-10) allows commercial kennels, and it also prevents complaints about barking dogs if any were to come up. I do my own vaccinations for the dogs; it's a lot cheaper to buy the shot at the feed store and administer it, but I cannot legally buy the rabies shot; so once a year I pack them all into the truck and off to the vet we go. The rabies shots are important for farm dogs because they have nearly-constant contact with wildlife, mostly rats. Getting some much-needed rain today; .2" -- pretty happy with the total so far. 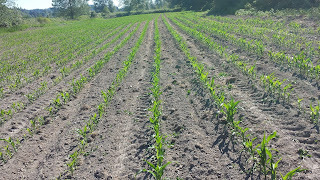 We could use another few tenths of an inch, but 48 hours into it I can see the corn perking up. 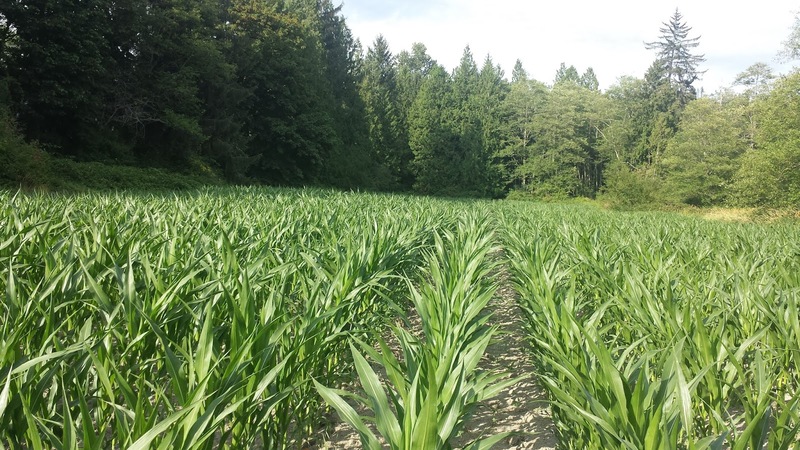 At this point the corn grows almost visibly; it's a pretty amazing plant. Forecast says that we get 6 days of sun and 90s starting tuesday, so I'm greasing the mower, rake and baler and getting ready to do the 3rd cutting of the year. I'm guessing we'll get 4 cuttings this year off the fields, which is exceptional. Breaking out the big gun! The drought is in earnest now; about 50 days since we had any measurable rainfall. I hooked up the irrigation equipment today, and I'll be pumping basically 24 hours a day for the next few days. The big gun (that spray nozzle you see at the left in the picture above) puts out about 100 gallons per minute with a 100' throw, which means that each time I set the sprinkler it waters about 2/3rds of an acre. It takes about 4 hours of operation to get water 3" deep into the soil, so each 2/3rd acre is getting about 4*60*100 or 24,000 gallons of water applied. 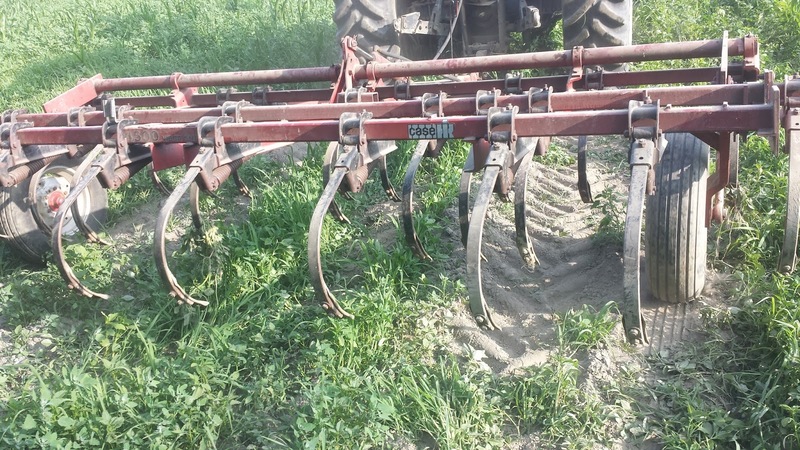 When people talk about irrigation they often talk about acre-feet. that is, enough water to cover an acre of ground in 12 inches of water. An acre foot of water is about 325,000 gallons. So I'm applying about 11% of an acre foot with a four-hour application, which works out to be a little over an inch of water over the entire area. For the areas that need water, I'll consume about 3.6 acre-feet of water over the course of this watering; a little over a million gallons. I'm drawing the water from my manure lagoon; so this is reclaimed water with manure and other stuff in it. So watering and fertilizing at the same time. I've got 14 acre feet of water in the lagoon, which means that I can do this sort of watering 3 times this year. My intention is the draw all of the water out of the manure lagoon this year so I can do some maintenance on the bottom of it. The previous owner of this farm dumped straight cow manure into the lagoon and those solids have reduced the total holding capacity of the sytem, so later this year I'll rent a long-reach trackhoe and scoop out all of the solids in preparation for the fall and winter rains. The big news about the corn is that there's no big news. 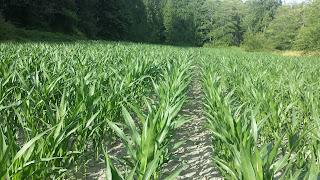 It's growing well, not really showing any signs of drought stress yet (despite 40 days of no rain at all) and the drought conditions have prevented weeds from growing in the field pretty much at all. So everywhere I planted corn it's about 4-5' tall and looks great. I'm breaking the farmer rule here: farmers lose the crop before they plant, they lose it during planting, and then they lose it a third time at harvest, of course. Pig sales this year have been robust. I've sold about 4/5ths of the pigs that I will sell this year already; the big market for pigs is in the late winter/spring months, and I sold 2100 pigs from feb to may, with the biggest sales month in april this year. That's earlier than most years, mostly prompted by the weather we've had round here. Warm and dry means people started getting their farms going earlier generally, and that means buying their yearly pigs early, too. 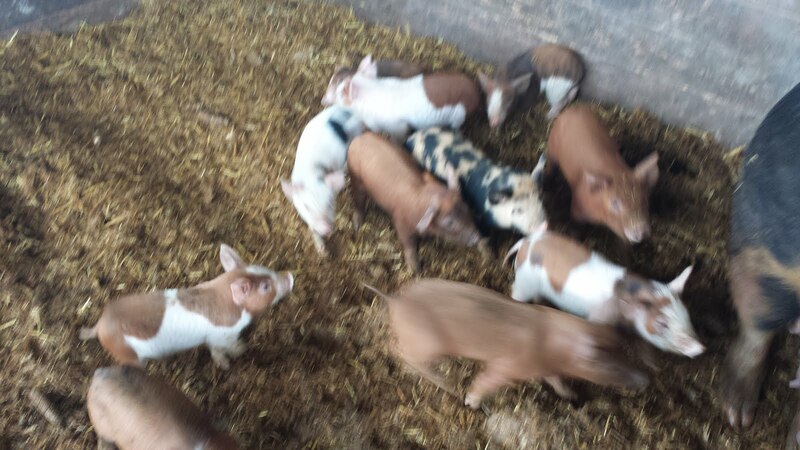 I'll probably end up with total pigs sales around 3,000 this year; the majority being weaned pigs, but our BBQ and suckling pig buisness is growing. We're filling orders for 7 to 10 roasting pigs a week at this time of year, and I'm seeing increasing demand. 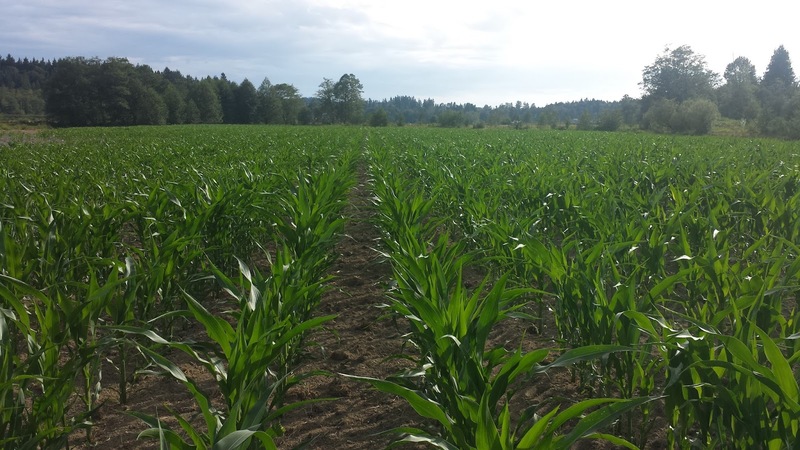 Feed prices: Feed prices were initially supposed to drop this year, but torrential rain in the midwest is reducing crop yields, and the jury is still out as to whether feed prices will rise or fall this year. 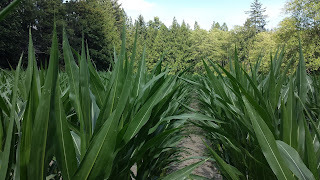 You can find people who claim both ends; I'm hoping that my corn this year takes me mostly out of that conversation entirely, with respect to my pig operation anyway. 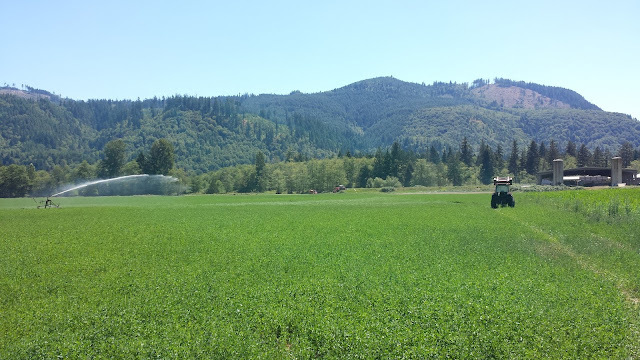 Hay: The drought has really impacted the growth rate of the orchard grass, reducing the yield quite a bit. 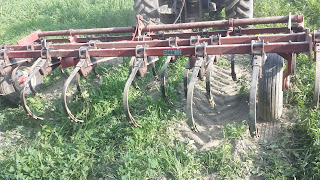 The alfalfa, with its deep tap roots, is doing fine, and I really hand't considered that when I put it in -- that alfalfa would resist a shorter drought and produce forage about as well as it does when it rains. that's a nice plus. it's at 1% bloom right now; I'll be cutting it at 10% bloom for my third cutting of the year, and at this rate will probably get a fourth cutting before I'm done. This third cutting will probably yield between 800 and 900 bales, putting my total at 3,000 bales in the barn, with a goal of 4,000 bales -- so a fourth cutting will get me where I need to be. Bees: The bees did swarm; I did capture them, thanks to my neighbor calling me to tell me where they'd landed, and honey-wise it looks like all of the hives are in good shape. I'm adding a frame of drone-comb to each hive for varoa mite control now. I'm breaking out the irrigation equipment to use the contents of the manure lagoon and hopefully empty it this year. I've got the tractor agitatating it right now, and I'll start pumping it tommorow. Happy with this field too. So earlier this year I looked at the long-term forecast and it called for warmer and drier than normal conditions. I took that forecast to heart and in my 2015 crop plan decided that I'd plant some grain-corn, calculating that I'd get enough heat to dry the corn so that I could harvest it as grain. Well, the long term forecasts were accurate. This is the warmest June and July that I can remember; we've had the longest string of over-80 days in... well, forever I think. At least as long as records have been kept. And the corn is loving it. So while I'm happy with the weather, I'm starting to get worried about the lack of rain. 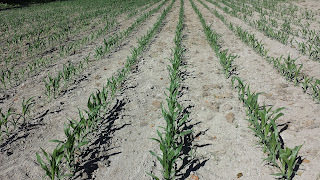 We haven't had measurable rain in more than a month; which really hasn't slowed the corn down much, but I can't imagine that it won't soon. 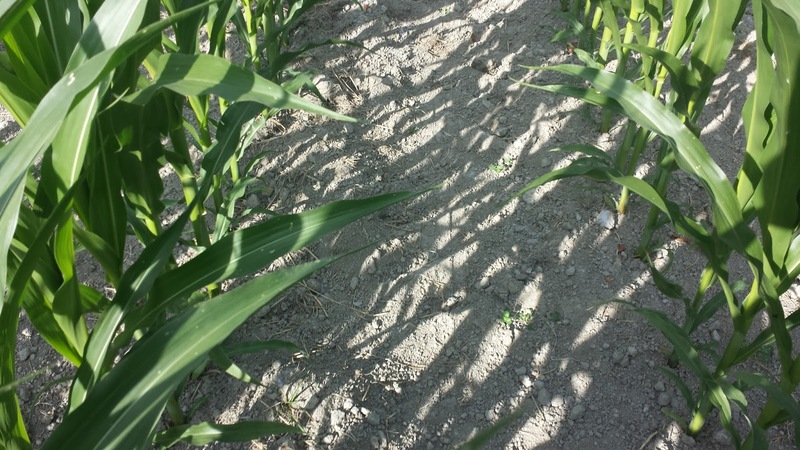 It's only planted 9" between the plants in the row, and that's too close, apparently, for drought conditions. "Why doesn't the author just start a farm and show us all how it can be done? She's clearly got the solution for our agrarian woes, right? The fix for factory farming. it's right there in her book. So why doesn't she provide a shining example and show how it can be done and make a profit? As an experienced farmer, I'd sure love to see that. She could teach us poor misguided farmers a thing or two. " 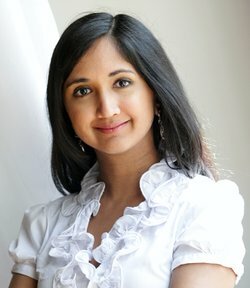 Here's this woman who took a long vacation and visited "60 farms in 3 countries over 2 years", (which means that she spent less than 2 weeks at any farm, and probably hours or minutes at some) and she's got the solution to every agricultural problem that we have, and she's gonna tell me the truth about farming. What I love about investment bankers is the sheer arrogance of the profession. Masters of the universe, indeed. Sonia Feruqi: She wrote the book. It must be true. This is part of the problem with farmers being only 2% of the population. Most people will read a book like this one and take it for gospel. In fact, if you read the comment section of the article i link to you can see one of the true believers of this book (who, mind you, has never read the book and admits as much in the discussion,) but apparently believes sight-unread, every single word that this book might contain. I don't know what it contains because it won't be released for another week, but it's already the "#1 new release in agronomy" on amazon, and has 20 glowing 5 star reviews. Congrats to your publicist, Sonia. they're doing a great job! 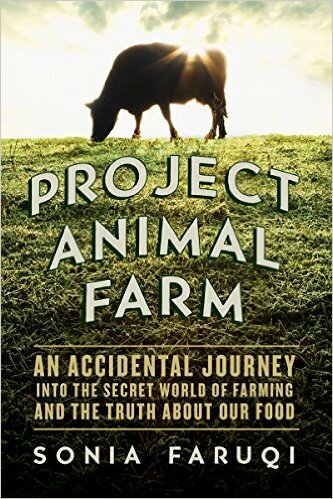 The author promotes her idea of an ideal farm, a "pastoral" farm, and apparently thinks that having 10,000 chickens is ok, but 100,000 chickens is not. I'm a little unclear on how more chickens is evil, but that's what she says. Maybe if 10,000 chickens are fine, having 5 brings you closer to being a perfect farmer? I don't know. You'll have to ask her. She's also apparently not a fan of automation -- she singles out robotic milking machines as being bad in her view. I wonder how she feels about tractors? Or should all of us misguided farmers be confined to the fields to pick her vegetables and carefully hand-wash them before we return to our hovels to humbly eat our porridge? I'm gonna challenge her to start using clay tablets in her investment banking gig. They are much better at developing upper body strength, and we can employ many people mining the clay and baking the tablets, and then storing them. Not to mention the recycling aspects! Feel free to post a review to this book if any of this hits a nerve. Balance in reviews is always good. Email question: Thinking about a property, how do I evaluate it as farmland? I got a question on email from someone who's looking to purchase some farmland; they're not looking to develop it or build a house, but would like to grow things. First, To get an idea of what the area will support, look at the land surrounding the parcel; it's likely that the soil and conditions for your parcel will be similar. So if they're growing hay, it's a fairly safe bet that you can grow hay; or berries, or whatever it is they're using it for. Recognize that the people who own that land have probably spent some time (years... decades...) finding out what works, and whatever it is that's what they're doing. If you're going to be doing exactly the same thing with the land that they are it's a safer bet that you'll have decent results. Second; put your boots on and walk the ground. Are there conditions that look different on the parcel -- more or less wet, different types of soils, rocks or vegetation? Whenever there's a change in vegetation that usually is a clue that the conditions there are different in some way. A different band of soil, seasonal flooding... something causes that difference. Ask around and see what that might be. In the area that I'm in the only farmland left at decent prices is in the flood plains, and anytime you're there there's risk of floods. Check with the neighbors to see how often it floods, and how deep, and for how long. 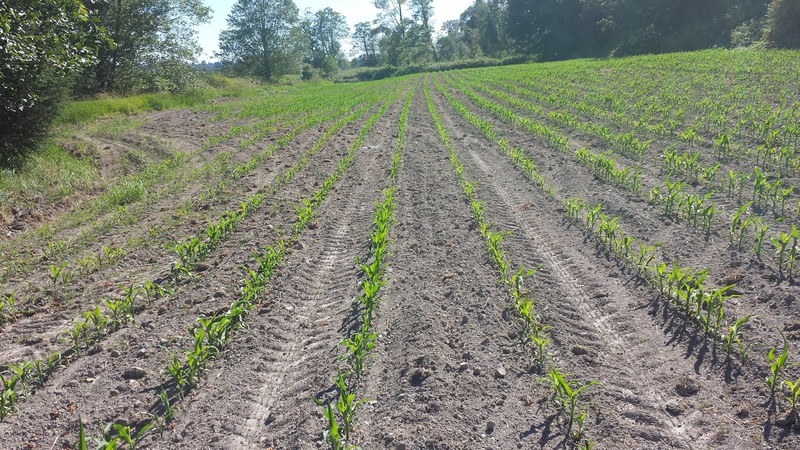 Most of the time floods don't matter to annual farming -- a flooded corn field after the corn is harvested is no big deal -- but it will affect perennial crops or things like orchards. blueberries can tolerate a bit of a flood. Bring a shovel on that trip, and a 5 gallon bucket. Collect 1-2 cups of dirt from 3 or 4 locations that represent the entire parcel. Strip the vegetation out, and mix it all up in a bucket, and have a soil test done. It'll cost you about $60 and take a week or 10 days. They will ask you what you want to grow, and they'll give you a report that says "to grow pumpkins on this ground you need..." and give you fertilizer or amendments and amounts that they reccomend. 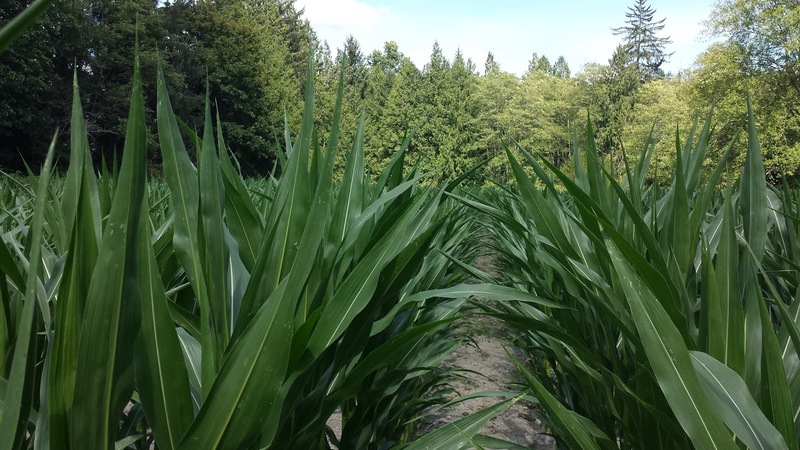 In this area Skagit Farmers supply in conway does tests; contact your local agricultural extension or conservation district for someone near you. For the parcel that I was asked about I'm going to guess (because of my experience with the ground in that area) that it's acidic soil with a fair bit of peat in it, and a relatively high water table. Those conditions are pretty darned good for things like cranberries or blueberries, but to grow crops like pumpkins my guess is that you'll need to add a lot of lime to bring the soil PH in line. 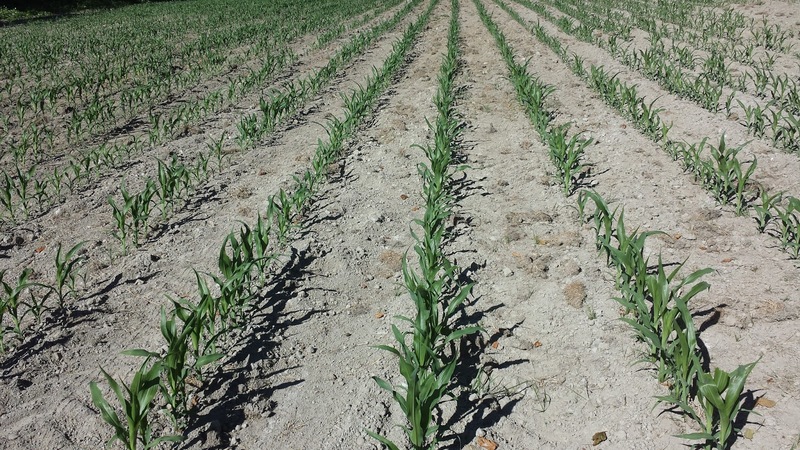 Your local conditions will vary, and a soil test will tell you what you need to know. 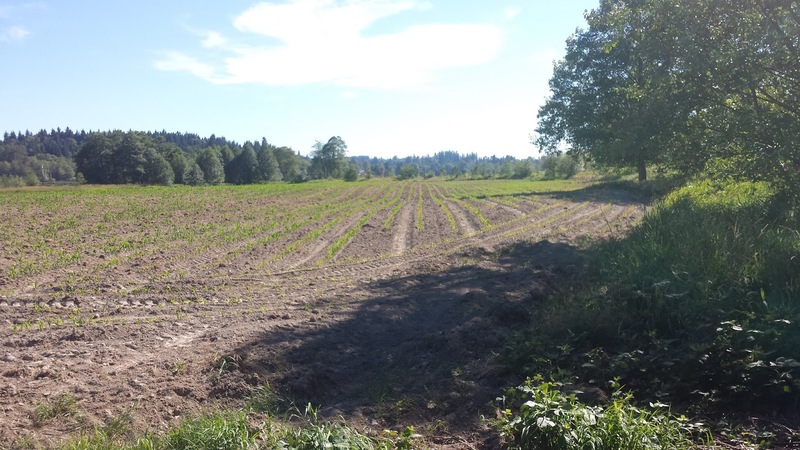 Finally, a 1-acre garden, intensively cultivated, will be quite a bit of work - more than a full-time job for one person; if you're contemplating buying more than that, you're going to need some sort of equipment to help you farm that ground. I can't say what that might be -- depends on the crops you plant -- but you may be able to horse trade a little work with the neighbors; they bale your hay in return for half, or for a per-bale fee, something like that. These are just my thoughts on this; I'm sure that they would love to hear more thoughts from others. This has been a very good summer for bees. In general they enjoy heat, and the heat is bringing out the blooms earlier and in greater numbers than in previous years. This combination means the bees are doing gangbusters. This sort of behavior isn't normal from the bees, even when it's hot. When they feel like its too hot they will have a few bees, or maybe a hundred sometimes, fanning air out the entrance to provide a breeze. they'll also go and get water, and sprinkle the water in the hive, and the evaporation of the water cools the hive. Bees are pretty good about maintaining a pretty precise temperature in the hive, mostly for the benefit of brood, but also to dry and cure the honey before they cap it. Below is a video of what normal hot-weather bee behavior is. It's way different from the beard of bees. These two videos were taken about 1 minute apart on the same day. 004 from bruce king on Vimeo. When you see the beard of bees its a pretty clear warning that a swarm will be coming very soon; the hive is not swarming right then, but it'll be in the next three days -- as soon as tommorow. My bees usually swarm between 10am and noon, and so I'll keep a careful watch on them from mid-morning to mid-afternoon. A swarm is pretty easy to see; 15 to 20 thousand beese flying in a dense cloud around the hive, eventually picking a direction and all flying in that direction. It's a little like a bee tornado, and you can see it from a couple of hundred feet away. The basic plan is to notice the swarm forming, and then hope that they land somewhere nearby -- following them with a new hive, you "capture" the swarm by moving the queen into the hive -- the rest of the bees will follow, and by dark they'll all be tucked into the new hive. I then close the hive entrance, and then move the hive back to the bee yard. What a swarm does is half the bees and the experienced queen leave the hive. Inside the hive, a new queen hatches, and her first act is to kill all the other queen cells to solidify her hive. She'll then mate with a dozen or so drones from this hive and other hives, and then return to her hive and start laying. her eggs will eventually produce more workers, and since she's in an established hive with stores of food and workers, the new queen usually does well. I won't open or disturb the hive for a few weeks after the swarm -- but I will check to make sure that the queen is laying eggs and raising brood, because sometimes the new queen doesn't work out. In that case I'll buy a new queen from a bee supplier and re-queen the hive with her. I don't want to lose the hive and workers. The experienced queen and the workers she takes with her have only the food in their bellies to set up in a new hive; so when I capture a swarm I'll usually either feed them with sugar water, or I'll put a comb of honey into the capture hive. Bees that have just swarmed are ready to make new honeycomb, so I'll usually use this opportunity to have them draw out new combs for their use; I'll put in flat sheets of stamped wax in the frames, and in the normal course of their business the bees will complete these frames. As with the donor hive, I own't disturb this hive for a few weeks, and then I'll look to make sure that the experienced queen is also happy and laying and functioning, re-queening if I need to. Since I was out in the bee yard I did pull 120lbs of honey off the hives; looking through the honey supers and taking the capped frames out, replacing them with new flat wax frames. One reason that bees swarm is that they feel crowded, so giving them more "space" in the form of areas that need work delays more swarms. too much sunshine and warmth; worry about the corn. Been two or three weeks since we got any rain at all; temps in the 80s to 90s in the day, 70 at night. for here that's an intense heatwave -- With little or no snowpack this winter, rivers are running at the lowest levels that have been seen in nearely a century, wtih several local rivers running at the lowest flows ever recorded. Cliff Mass, a meteorology professor at ther University of Washington says that this is what the weather in this area of the country will be like regularly in 2070; I don't know about 2070, but it sure does remind me of the weather that I grew up with in southern and northern california. So the lack of rain has surpressed the weeds in the corn field, but two weeks into this, I'm starting to worry about the corn. There's still moisture in the ground, but I'm guessing that it's not growing as fast as it would with more water. for these fields I don't have any way to irrigate them, so I'm "dryland" farming them -- which for western washington is roughly equivalent to irrigated acres most years, but for the last few weeks it's been truely dry. 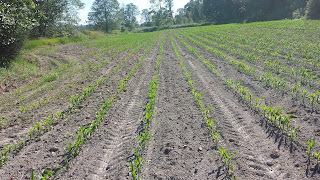 Corn in lower field. Looks good. I planted this cron in 30" rows, 9" in the row, and that's usually fine for this climate; but with a long dry spell most of the internet seems to think that spacing a little further apart works better, and is more drought-resistant. I'm noting it, and watching the corn for now. All this sun does make wonderful hay, though. Perfect hay. Put another 900 bales into the barn; so the running total for this year is 2100 bales. If I get another 1600 bales I'll be done with a surplus for this coming winter. Two more cuttings and with the weather the way it is, and able to irrigate out of the manure lagoon, should be able to get it done.